An arrhythmia is an irregular heartbeat - the heart may beat too fast (tachycardia), too slowly (bradycardia), too early (premature contraction) or too irregularly (fibrillation). Arrhythmias are heart-rhythm problems - they occur when the electrical impulses to the heart that coordinate heartbeats are not working properly, making the heart beat too fast/slow or inconsistently. Rapid arrhythmias are called tachycardias, while slow ones are called bradycardias. Irregular arrhythmias - when the heartbeat is irregular - are called fibrillations, as in atrial or ventricular fibrillation. When a single heartbeat occurs earlier than it should it is called premature contraction. The electrical impulses that cause the heart to contract must follow a precise pathway for it to work properly. Any interruption to these impulses can result in arrhythmia. The human heart consists of four chambers - the chambers on each half of the heart form two adjoining pumps, with the atrium (upper chamber) and the ventricle (lower chamber). When a heartbeat occurs the less muscular and smaller atria contract and fill the relaxed ventricles with blood. The contraction starts when a small group of cells in the right atrium (the sinus node) send an electrical impulse which causes the right and left atria to contract. The impulse then moves to the atrioventricular node (at the center of the heart) on the pathway between the atria and ventricles. From here the impulse leaves the atrioventricular node, travels through the ventricles, causing them to contract and pump blood - this blood pumps throughout the body. For a person with a healthy heart the process works properly and he/she should have a heart rate of between 60 and 100 beats per minute when resting. The fitter you are the lower your resting heart rate. Olympic athletes, for example, will usually have a resting heart rate of less than 60 beats per minute because their hearts are very efficient. A healthy person will hardly ever suffer from long-term arrhythmia unless he/she has an external trigger, such as drug abuse or an electric shock. If there is an underlying problem, however, the electrical impulses may not be able to travel through the heart correctly, increasing the likelihood of arrhythmia. Reduction in blood supply - a drop in blood supply to the heart can alter the ability of heart cells and tissue to conduct electrical impulses. Damaged or destroyed heart tissue - if heart tissue has died or is damaged the way electrical impulses spread in the heart can be affected. CAD (coronary artery disease) - this is when the arteries in the heart narrow, often resulting in a heart attack (some of the heart muscle dies because of a lack of blood flow). 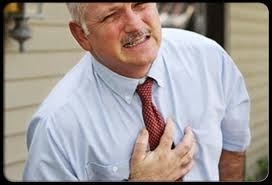 Heart attacks cause scarring of the heart tissue. Scarred heart tissue interfere with the proper movement of electrical impulses which make the heart beat. The heart may beat too fast (ventricular tachycardia) or irregularly (ventricular fibrillation). Cardiomyopathy - disease of the myocardium (heart muscle). The walls of the ventricles may stretch or enlarge, or the left ventricle wall may thicken and constrict. The heart's blood-pumping efficiency is affected, often resulting in heart tissue damage. Valvular heart diseases - if the heart valves narrow or leak the heart muscle can stretch and thicken. If valves are tight or leaking there is a significant risk of developing arrhythmia. Where they originate - the atria or ventricles. The heart rate - fast (tachycardia - over 100 beats per minute), slow (bradycardia - less than 60 beats per minute). High or slow heart beats do not necessarily mean there is heart disease. Our heart rate increases during exercise - this is normal. 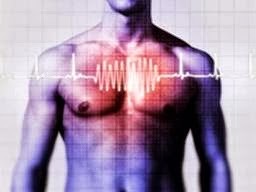 Some extremely fit athletes have a resting heart rate of less than 60 beats per minute. Atrial fibrillation - this means irregular beating of the atrial chambers - usually fast. Atrial fibrillation is a common type of arrhythmia and mainly affects elderly patients. A person's risk of developing atrial fibrillation increases significantly after the age of 60; especially if he/she had hypertension or some other heart problem. Instead of producing a single, strong contraction, the chamber fibrillates (quivers). 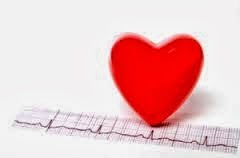 In some cases the heartbeat of a person with atrial fibrillation can go up to 350 beats per minute, and even 500 or 600. Over the medium or long-term atrial fibrillation can cause stroke, as well as some other serious conditions. Atrial flutter - the difference between atrial flutter and fibrillation is that flutter is well organized while fibrillation is not. Atrial flutter can come and go, as can atrial fibrillation. Atrial flutter can be serious. A patient with atrial flutter will typically experience 250 to 350 beats per minute. Supraventricular tachycardia (SVT) - a regular, abnormally rapid heartbeat caused by rapid firing of electrical impulses from a focus above the atrioventricular node (in the heart). It is called SVT because the rapid heartbeat originates above the ventricles of the heart. The patient experiences a burst of accelerated heartbeats that can last from a few seconds to some hours. These bursts often occur when the electrical impulse from a heartbeat starts to circle through the extra pathway. Typically, a patient with SVT will have a heart rate of between 160 and 200 beats per minute. SVT can be caused by an underlying heart condition. Young people with normal hearts may experience SVT (racing heart) - however, although it may feel uncomfortable, it is not usually life-threatening. Wolff-Parkinson-White (WPW) syndrome - there is an extra electrical connection inside the heart that acts as a short circuit, resulting in an abnormally fast heart beat (sometimes irregular). This syndrome can be life-threatening, although it is unusual. Ventricular tachycardia - abnormal electrical impulses that start in the ventricles cause abnormally fast heart beating. Typically, the heart will have a scar from a previous heart attack, which forces the electrical signal to travel around it. Usually, the ventricle will contract more than 200 times a minute. Unsustained VT - this lasts for up to about 30 seconds and is usually harmless. However, there is a risk of longer-lasting VT eventually. Sustained VT - this is longer-lasting and is a medical emergency. Ventricular fibrillation - irregular heart rhythm consisting of very rapid, uncoordinated fluttering contractions of the ventricles (lower chambers of the heart). The ventricles do not pump blood properly (they quiver uselessly instead). Blood pressure drops dramatically, depriving vital organs, including the brain, of their essential blood supply. The majority of patients lose consciousness fairly quickly and require emergency medical assistance, including CPR (cardiopulmonary resuscitation). Patients who receive CPR until their heart can be shocked back into a normal rhythm with a defibrillator have much better survival rates. If the patient does not receive CTP or defibrillation he/she will die within minutes. Ventricular fibrillation is usually associated with some kind of heart disease. Ventricular fibrillation is often triggered by a heart attack. Long QT syndrome - a heart rhythm disorder that may sometimes cause rapid, uncoordinated heartbeats. The name of the syndrome comes from the QT segment in the tracing on the electrocardiogram, which lasts slightly longer in the syndrome than normal. The rapid heartbeats can result in fainting, which may be life-threatening. In severe cases the heart rhythm may become so chaotic that it causes sudden death. Some people inherit a faulty gene which increases their risk of developing Long QT syndrome. A significant number of medications may also cause Long QT syndrome. Sick sinus - a problem with the sinus node of the heart. The sinus node is the heart's natural pacemaker. If it does not function properly the patient's resting heart rate may be abnormally low (bradycardia). If the sinus node functions properly, sick sinus may be caused by scarring near the sinus node which undermines the movement of electrical impulses. Conduction block - a block of the electrical pathways of the heart. This can occur in or close to the atrioventricular node, located on the pathway between the atria and the ventricles. The block may be along the other pathways to each ventricle. The electrical impulses between the upper and lower halves of the heart may be slowed or blocked; this depends on the type of block and where it is. If the signal is totally blocked, some cells in the atrioventricular node or ventricles can make a steady but slower heartbeat. The patient may experience skipped heartbeats or bradycardia - sometimes there are no symptoms at all. Premature heartbeats - this occurs in the ventricles and comes before the ventricles have had time to fill with blood after a regular heartbeat. 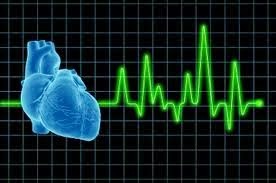 A premature heartbeat occurs between two normal heartbeats. However, the patient will feel he/she has skipped a heartbeat. In most cases the occasional premature beat is nothing to worry about. However, it can trigger a longer-lasting arrhythmia - this is especially the case if the patient has heart disease. What are the signs and symptoms of arrhythmia? Some patients may have no symptoms at all. 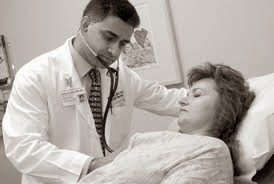 A doctor may detect a sign of arrhythmia during a routine examination. (The patient detects/feels a symptom, and other people, such as the doctor or other members of the household, detect a sign). Even if a patient notices symptoms, it does not necessarily mean there is a serious problem. Ironically, some patients with life-threatening arrhythmias may have no symptoms, while others with symptoms may not have a serious problem. Sinus arrhythmia. Cyclic changes in the heart rate during breathing. Common in children and often found in adults. Sinus tachycardia. The sinus node sends out electrical signals faster than usual, speeding up the heart rate. Sick sinus syndrome. The sinus node does not fire its signals properly, so that the heart rate slows down. Sometimes the rate changes back and forth between a slow (bradycardia) and fast (tachycardia) rate. Premature supraventricular contractions or premature atrial contractions (PAC). A beat occurs early in the atria, causing the heart to beat before the next regular heartbeat. Supraventricular tachycardia (SVT), paroxysmal atrial tachycardia (PAT). A series of early beats in the atria speed up the heart rate (the number of times a heart beats per minute). In paroxysmal tachycardia, repeated periods of very fast heartbeats begin and end suddenly. Atrial flutter. Rapidly fired signals cause the muscles in the atria to contract quickly, leading to a very fast, steady heartbeat. Atrial fibrillation. Electrical signals in the atria are fired in a very fast and uncontrolled manner. Electrical signals arrive in the ventricles in a completely irregular fashion, so the heart beat is completely irregular. Wolff-Parkinson-White syndrome. Abnormal pathways between the atria and ventricles cause the electrical signal to arrive at the ventricles too soon and to be transmitted back into the atria. Very fast heart rates may develop as the electrical signal ricochets between the atria and ventricles. Premature ventricular complexes (PVC). An electrical signal from the ventricles causes an early heart beat that generally goes unnoticed. The heart then seems to pause until the next beat of the ventricle occurs in a regular fashion. Ventricular tachycardia. The heart beats fast due to electrical signals arising from the ventricles (rather than from the atria). Ventricular fibrillation. Electrical signals in the ventricles are fired in a very fast and uncontrolled manner, causing the heart to quiver rather than beat and pump blood. What are the different types of an arrhythmias? There are many types of arrhythmias. Arrhythmias are identified by where they occur in the heart (atria or ventricles) and by what happens to the heart's rhythm when they occur. Blood and urine tests - these will check the patient's blood count and liver, thyroid, and kidney function. The doctor may also want to check the blood for specific chemical markers of heart failure, such as BNP (brain natriuretic peptide) - this hormone is secreted at high levels by the heart if it is injured or overburdened, but is first identified in the brain. Serum electrolytes may also be tested to evaluate sodium and potassium levels. An ECG (electrocardiogram) - this device records the electrical activity and rhythms of the patient's heart. Electrodes are attached to the patient's skin and impulses are recorded as waves and displayed on a screen (or printed on paper). The test may also reveal any damage to the heart from a heart attack. A Holter monitor - the patient wears a portable device which records all his/her heartbeats. It is worn under the clothing and records information about the electrical activity of the heart while the patient goes about his/her normal activities for one or two days. It has a button which can be pressed if symptoms are felt - then the doctor can see what heart rhythms were present at that moment. Event recorder (event monitor) - This machine is similar to a Holter monitor, but it does not record all the heartbeats. There are two types: 1. One uses a phone to transmit signals from the recorder while the patient is experiencing symptoms. 2. The other is worn all the time for a long time; sometimes as long as a month (it must be taken off when showering or having a bath). This device is good for diagnosing rhythm disturbances that happen at random moments. An echocardiogram - this is an ultrasound scan that checks the pumping action of the patient's heart. This test also helps distinguish systolic heart failure from diastolic heart failure (the heart is stiff and does not fill properly). Sound waves are used to create a video image of the patient's heart, which helps the doctor see how well the heart is pumping. The doctor measures the percentage of blood pumped out of the patient's left ventricle (the main pumping chamber) with each heartbeat - this measurement is call the ejection fraction. An ejection fraction is a crucial measurement which determines how well the heart is pumping. A healthy heart pumps out approximately 60% of the blood that fills the ventricle with each beat - a healthy heart has an ejection factor of 60%. Chest X-ray - The images help the doctor check the state of the patient's heart and lungs. A chest X-ray may also help a doctor determine whether the patient has any congenital heart defects. Other conditions that may explain the signs and symptoms might also be detected. Tilt-table test - If the patient experiences fainting spells, dizziness or lightheadedness, and neither the ECG nor the Holter revealed any arrhythmias, a tilt-table test may be performed. This monitors the patient's blood pressure, heart rhythm and heart rate while he/she is moved from a lying down to an upright position. A healthy patient's reflexes cause the heart rate and blood pressure to change when moved to an upright position - this is to make sure the brain gets an adequate supply of blood. If the reflexes are inadequate, they could explain the fainting spells, etc. Electrophysiologic testing (or EP studies) - This is an invasive, relatively painless, non-surgical test and can help determine the type of arrhythmia, its origin, and potential response to treatment. The patient is given a local anesthetic. After an initial puncture an introducer sheath is inserted into a blood vessel. A catheter is inserted through the introducer sheath and is threaded up the blood vessel, through the body and into the right chambers of the heart. The electrophysiologist can see the catheter moving up the body on a monitor. When it is inside the heart the catheter stimulates the heart and records where abnormal impulses start, their speed, and which normal conduction pathways they bypass. Treatments can be given to find out whether they stop the arrhythmia. The catheter and introducer sheaths are then removed, and the insertion site is closed up either by applying pressure to the site or with stitches. How does the doctor know that I have arrhythmia? Sometimes an arrhythmia can be detected by listening to the heart with a stethoscope. However, the electrocardiogram is the most precise method for diagnosing the arrhythmia. The vast majority of people with arrhythmias have nothing to fear. They do not need extensive exams or special treatments for their condition. In some people, arrhythmias are associated with heart disease. In these cases, heart disease, not the arrhythmia, poses the greatest risk to the patient. In a very small number of people with serious symptoms, arrhythmias themselves are dangerous. These arrhythmias require medical treatment to keep the heartbeat regular. For example, a few people have a very slow heartbeat (bradycardia), causing them to feel lightheaded or faint. If left untreated, the heart may stop beating and these people could die. What happens in the heart during an arrhythmia? The heart is a muscular pump divided into four chambers--two atria located on the top and two ventricles located on the bottom. Normally each heartbeat starts in the right atrium. Here, a specialized group of cells called the sinus node, or natural pacemaker, sends an electrical signal. The signal spreads throughout the atria to the area between the atria called the atrioventricular (AV) node. What are the treatment options for arrhythmia? Treatment for arrhythmia is only required if it is putting the patient at risk of a more serious arrhythmia or a complication. If the bradycardia is caused by an underlying problem, such as an underactive thyroid gland, or a drug side effect, that problem needs to be treated first. If no underlying problem is found, the doctor may advise implanting a pacemaker. Pacemaker - this device replaces the job of the atrioventricular node. A pacemaker is a small device that is placed under the skin of the chest or abdomen to help control abnormal heart rhythms; it uses electrical pulses to prompt the heart to beat at a normal rate. Certain maneuvers the patient can do himself/herself may stop an arrhythmia that starts above the lower half of the heart (SVY). This may involve the patient holding his/her breath and straining, coughing, or submerging the face in ice-cold water. The doctor, nurse or a specialized physical therapist may suggest other maneuvers. These maneuvers affect the vagal nerves and often cause the heart rate to slow down. These will not cure the patient, but are usually effective in reducing episodes of tachycardia as well as slowing the heart rate down when they occur. Anti-arrhythmic medications need to be taken correctly for best results and to avoid complications. In some cases, if the medications slow the heart down too much the patient may need to have a pacemaker. If the tachycardia starts in the atria (top half of the heart) and includes atrial fibrillation, the doctor may use an electric shock to reset the heart to its regular rhythm - this is called cardioversion. It is carried out externally; the patient is usually given a drug to relax. The procedure is painless. Ablation means "taking the disease away". One or more catheters go through blood vessels into the inner heart. They are placed in areas of the heart that are thought to be the sources of the arrhythmia. Electrodes at the ends of the catheter are heated. Sometimes the tips are cooled down and the problem tissue is frozen. A small spot of heart tissue is destroyed (ablated), creating an electrical block along the pathway that is causing the arrhythmia. If the patient is at high risk of developing a very fast or quivering (fibrillating) heartbeat in the ventricles, an ICD may be implanted. There are also ICDs for atrial fibrillation (quivering in the upper half of the heart). The device is implanted near the left collarbone - electrode-tipped wires go from the ICD, through veins, to the heart. The ICD monitors the heart rhythm and paces the heart, just like a pacemaker as soon as it detects an abnormally slow rhythm. Experts say that an ICD is better at significantly reducing the risk of a fatal arrhythmia than medications. A series of surgical incisions are made in the atria (upper half of the heart). They then heal into scars in the atria that form boundaries that make the electrical impulses travel properly so that the heart beats efficiently. This is open-heart surgery and is usually used for patients who have not responded well enough to other treatments. Maze procedures have a good success rate. If an aneurysm (bulge) in a blood vessel that leads to the heart is causing the arrhythmia and other treatments did not work, a surgeon may remove the aneurysm. This surgical procedure has a good success rate - it is sometimes used if the implanted ICD or catheter ablation did not work. A patient with frequent ventricular tachycardia who also has severe coronary artery disease may be advised to undergo coronary bypass surgery. Arteries or veins from elsewhere in the patient's body are grafted to the coronary arteries to bypass atherosclerotic narrowings and improve the blood supply to the coronary circulation supplying the heart muscle (myocardium). How can arrhythmias be prevented? If heart disease is not causing the arrhythmia, the doctor may suggest that you avoid what is causing it. For example, if caffeine or alcohol is the cause, the doctor may ask you not to drink coffee, tea, colas, or alcoholic beverages.